Christie projectors provided visuals for spectators at Singapore’s 50th birthday celebrations on August 9. The projection mapping performances were planned and executed by Christie’s rental staging partner Hexogon Solution Pte Ltd at three locations: the Padang, the Sentosa Merlion and the Fullerton Hotel. 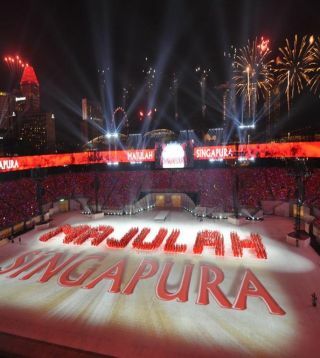 One of the visualizations used in Singapore's 50th birthday celebration. More than 120 Christie projectors comprising the Boxer 4K30 and Roadster HD20K-J displayed multimedia content for Singapore’s Golden Jubilee, also known as SG50. For the National Day Parade, 64 Christie Boxer 4K30s were installed above the National Gallery of Singapore, creating a 100-meter by 70-meter canvas on the performance floor. The team from Hexogon Solution also created motion graphics that complemented the movements of the 3,500 performers on the two-tiered stage. As part of the SG50 celebrations, Hexogon Solution also deployed four Boxer 4K30 projectors in portrait mode to deliver an eight-minute projection mapping show on the facade of the Sentosa Merlion.